Those words probably stir up visions of getting a great deal AND getting the quality silk flowers you crave. For the most part, this is true. But...you may find that buying silk flowers wholesale can end up costing much more than you expected. In this article we'll explore some sources, and I'll tell you some of my experiences. Before you get too excited, though, there is some 'bad' news...in general, in the USA, in order to purchase silk flowers at TRUE wholesale from a REAL wholesale supplier, you must be a LEGAL, REGISTERED BUSINESS with a TAX I.D. number. Similar requirements may apply outside the USA. Registration requirements can vary from state to state. Check with your local County Clerk office for more information if you're curious. When you deal with a real wholesaler, they will ask for a copy of your Tax I.D. certificate before doing business with you. OK, maybe you knew that. Then you probably also know that you must buy product in a quantity as packed by the manufacturer...minimum order of one dozen for this orchid spray, two-in-a-box of that potted fern. Remember, they are wholesalers. They expect that you are a business entity, reselling their product at retail prices. Buying in quantity is the rule. And then there is usually a minimum purchase requirement...for example, your first order must total $250. After that, any order must total $100. But hold on. All is not lost...there are still great deals waiting for you out there. Forget about buying silk flowers wholesale — true wholesale — for a moment. Are They Really Selling You Silk Flowers at Wholesale Price? If you do an internet search for 'silk flowers wholesale' you will get mixed results. The listings will more than likely be for online businesses that are eager to sell you...discount silk flowers! Many discounters may have you think they are wholesalers, but now you know you must be a registered business to get true wholesale pricing. On the other hand, some of them honestly DO cater to both consumers and businesses — offering good prices to the general public, and wholesale prices to qualifying businesses. When you, as a consumer, find a source that offers discount silk flowers, you might have it both ways. You may have the option to buy one silk flower stem at the 'regular low price,' or buy six of an item at a reduced price...not wholesale, but quantity discounts if you want them...yeah, baby! OK, back to the subject now — you wanted to know about buying silk flowers wholesale, remember? Assuming you meet the business requirements or know a friend who does (hint), let's go find some possible wholesalers who might even provide us with their fabulous PRINTED silk flower catalogs! 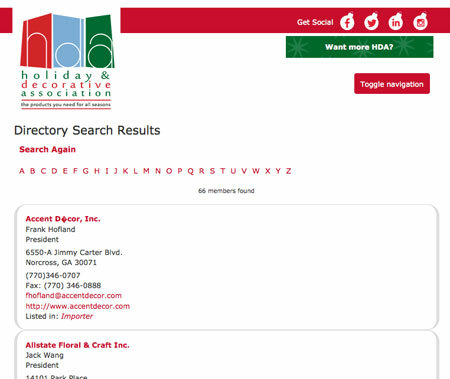 The American Floral Industry Association's Member Directory is a good place to start looking for silk flowers wholesale and related floral supplies in the USA. Members of this organization are importers, manufacturers, wholesalers, retailers, sales representatives and others involved in the permanent botanical, holiday and decorative accessories industry. Here you will find listings for North American companies that provide artificial floral, holiday and seasonal home decor products. This is a real treasure trove — listings have full contact information and website links where available, so you can explore further. You might also investigate the Wholesale Florist and Florist Supplier Association's website for supplier listings in Canada and the USA, and perhaps other countries. 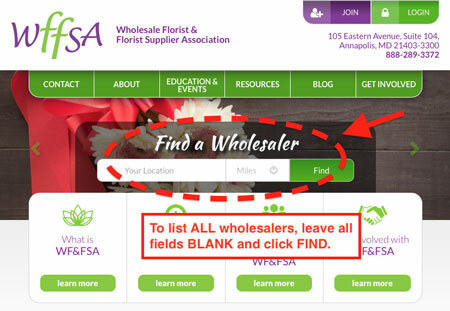 In the 'Find a Wholesaler' window you can type in your specific location to find a vendor near you, OR just click FIND to list ALL wholesalers. Don't overlook these wholesale suppliers to retail 'fresh-cut' florists — many also offer silk flowers and other permanent botanicals, giftware, and related floral supplies such as containers, baskets, ribbon, seasonal and decorative accessories. So, you might have the best of both worlds if you choose — fresh-cut AND silk flowers wholesale! For the most part these days, companies in any industry are creating online DIGITAL PDF catalogs to save printing expense. The companies that actually print color silk flower catalogs may send them to you upon request, usually for a small fee — around $10 or $20. Look for contact information on a website. All it takes is an email or phone call to find out if printed catalogs are an option. If you call, they will ask for your business name and mailing address. They usually won't ask for your Tax I.D. number yet — that's not really needed until you place an order. On the other hand, since printed catalogs are expensive to produce, they might ask for it. If you are not a legitimate business, your request may be declined. 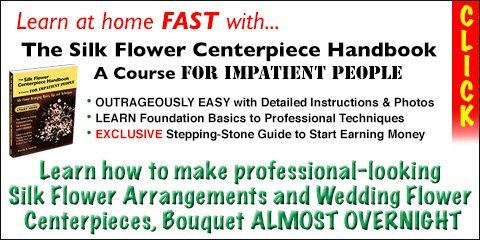 Believe me, when you can get access to these floral industry catalogs — digital or printed — you will be amazed at the variety and selection of artificial and silk flower products which you may never have known were available. Their minimum first order requirement was a reasonable $100. If any future orders were less than $100, a $10 processing fee would apply. When I placed my order, the customer service folks were very helpful by offering complementary or alternate suggestions, which I was directed to view in the catalog while on the phone. Aldik’s customer service was very friendly and helpful in providing information and guidance. I called in my catalog request and received gorgeous catalogs showcasing silk flowers, foliage, trees and decorative accents. Each was about 100 pages. Although design and layout can change, the Aldik’s catalogs I received were works of art — clean, very well organized. They were thoughtfully broken down into section groupings, such as Drop-Ins, Cuttings, Berries, Flowering Plants, Tropicals and so on. Items listed dimensions and colors. Depending on each year’s catalog design, the wholesale prices may be at the back or may be coded within item listings. There were separately printed pricelists available. To buy silk flowers wholesale from Aldiks, the first-time order requirement was $500, thereafter each order had a $250 minimum. The original Aldik's company closed its doors in May 2009, but there is a 'new' site at http://www.aldikhome.com. Here are FREE Wholesale and Dropshipping VIDEOS composed of short, informative segments that will increase your understanding of how to find and work with wholesale suppliers — for any product. If you prefer to read, here are FREE Internet Business and Dropshipping eBooks for you. Be careful when ordering from silk flower catalogs or websites. You can't accurately judge size from pictures of a single item. I once unknowingly ordered an item from a catalog that had blossoms as big as my head! If listed, check dimensions to assure that blossom sizes and stem height are right for your floral design. You could call the merchant if dimensions are not listed. Also, be aware that actual color may vary a bit from what you see onscreen or in a catalog. Silk flower catalogs are a huge help to planning a floral design, but seeing the physical products up close is still the best way to shop. Review the merchant return policy before placing an order. There may be a 5% to 20% restocking fee for returns (if due to your mistake). If you are ordering from a silk flowers wholesale source that is outside your country of origin, there may be a customs and import fee on top of product and shipping costs. Bottom line: If you've got money (to meet minimum purchase requirements), storage space (to keep your quantity purchases) and a business license, buying silk flowers wholesale is available to you. Otherwise, purchasing discount silk flowers is the way to go.